We supply expanded steel rib lath box girders, in various widths, rib heights and rib spacings, available in stainless or galvanised steel. Galvanized steel zinc plated rib lath box girder is processed from coils of sheet steel. The sheet is slit and expanded into a herring bone pattern with metal ribs running about every 3 inches on the long direction of the sheet. This product is typically stapled, nailed or screw applied to the substrate. It can also be tie wire attached to cold rolled grillage. 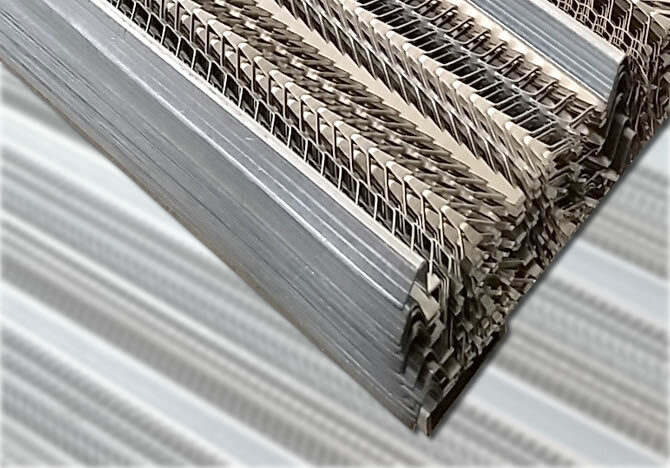 Expanded metal lath has diamond shaped openings made in a similar manner as rib lath but without the ribs. It too is attached with staples, nails screws or tie wire. Regardless of the lath being used, weather-resistant barrier paper should be omitted on ceilings and soffits. Strips of paper may be installed to minimize blow-by from a gun-applied scratch coat. These strips do not hold back water in the ceiling. While these strips of paper make it harder to tie wire the lath to the grillage, it is possible. The flat and 3/8” galvanised iron rib lathing is designed for framing in various building constructions. According to table 3 of ASTM standard C 1063, expanded metal steel lath is approved for use on the underside of horizontal surfaces with framing supports spaced up to 16” on center. Flat rib expanded lath 3/8” high rib attached to supports for ceilings framing, can span 24” on center. Looking for other types of lathing products? Welcome to contact us with your specific requirements.